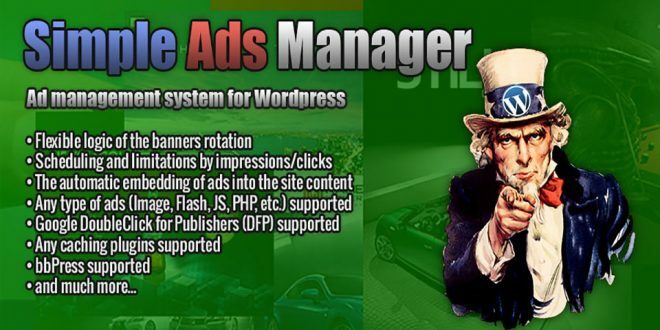 Until recently I used the plugin “Advertising Manager”. However, I am not quite satisfied the set of its capabilities. For example, the inability to display scheduled advertisements, or the inability to display ads in the posts only certain categories. Etc. 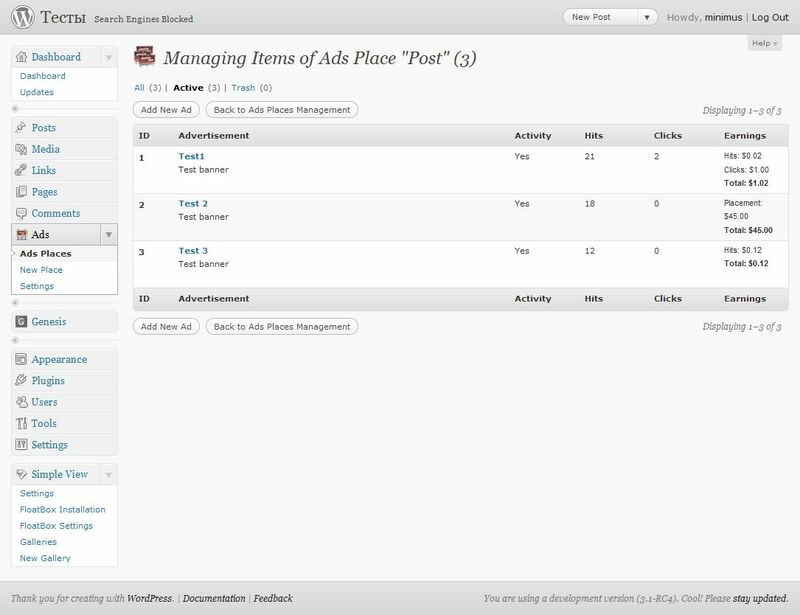 That’s why I wrote my own plugin to control the advertising on the blog – Simple Ads Manager. 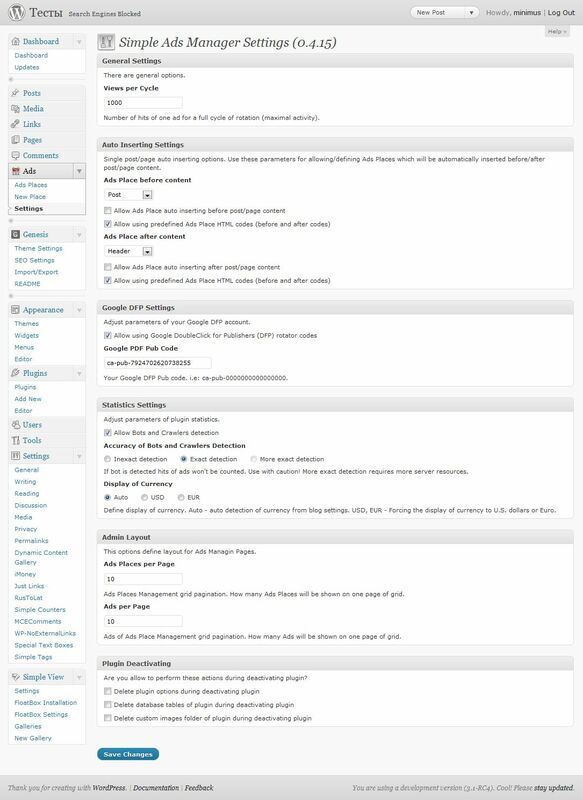 I tried to create a plugin that will satisfy most requests of any blogger to manage advertising on the blog. And I think I managed it. Note: Now this plugin is partially deprecated. If your site works under PHP 5.3 or later version (include PHP 7.0) it is better to use SAM Pro (Free Edition). 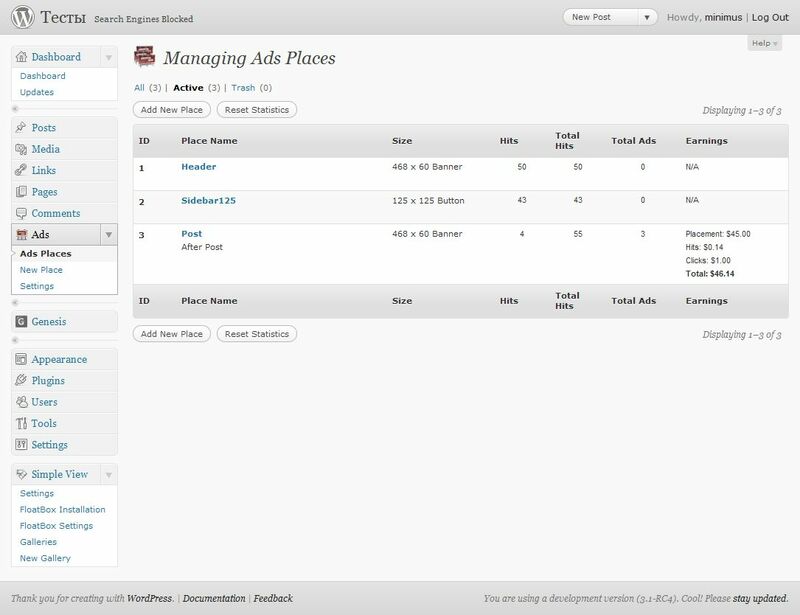 The main object of the plugin is “Ads Place“. Each Ads Place is a container for the advertisements and provides the logic of the show and rotation. In addition, one of the parameters of advertising space is “patch ad code”, ie ad to be shown if and only if the logic of ads this Ads Place does not permit to show none of the advertisements contained in this Ads Place. One Ads Place can contain any number of objects “advertisement”. Object “advertisement” rigidly attached to his container “Ads Place”. Its parameters determine frequency (weight) of displaying and limiting displaying from “show all pages” to “show the articles with ID … ” and show from date to date (the schedule). Additional object “Ads Zone” is selector developed for increasing the flexibility of displaying ads. This optional object can be useful for conducting advertising campaigns using a large number of promotional materials. The additional object “Ads Block” allows to display the block of advertisements. Views per Cycle – the number of impressions an ad for one cycle of rotation, provided that this ad has maximum weight (the activity). In other words, if the number of hits in the series is 1000, an ad with a weight of 10 will be shown in 1000, and the ad with a weight of 3 will be shown 300 times. Do not set this parameter to a value less than the maximum number of visitors which may simultaneously be on your site – it may violate the logic of rotation. Not worth it, though it has no special meaning, set this parameter to a value greater than the number of hits your web pages during a month. Optimal, perhaps, is the value to the daily shows website pages. Display Ad Source in – you can display advertisement target in new or current window (tab). Select target window (tab). Auto Inserting Settings – here you can select the Ads Places and allow the display of their ads before and after the content of single post. Google DFP Settings – if you want to use codes of Google DFP rotator, you must allow it’s using and define your pub-code. For obtaining of more exact indexes of statistics and incomes it is preferable to exclude data about visits of bots and crawlers from the data about all visits of your blog. If enabled and bot or crawler is detected, hits of ads won’t be counted. Select accuracy of detection but use with caution – more exact detection requires more server resources. Allow Bots and Crawlers detection – If allowed, hits of detected bot won’t be counted. Inexact detection – This method is based on an analysis of the request header. Inaccurate method. Exact detection – This method uses the Browser library by Chris Schuld for detection of bots. Recommended. More exact detection – This method uses “browscap” data for bots detection. Very exact and very slow method. If browscap not defined in your php.ini, this method is unavailable. Auto – auto detection of currency from blog settings. USD – Forcing the display of currency to U.S. dollars. EUR – Forcing the display of currency to Euro. Go to your list of Ads Places (Ads -> Ads Places) and click the “Add New Place”. In the opened editor window configure current Ad Place. Enter a name and a description of the Ads Place. In principle, it is not mandatory parameters, because these parameters don’t influence anything, but experience suggests that after a while all IDs usually will be forgotten and such information may be useful. Ads Place Size – in this version is only for informational purposes only, but in future I plan to use this option. It is desirable to expose the real size. Ads Place Patch – it’s an ad that will appear in the event that the logic of basic ads outputing of this Ads Place on the current page will not be able to choose a single basic ad for displaying. For example, if all basic announcements are set to displaying only on archives pages or single pages, in this case the patch ad of Ads Place will be shown on the Home page. Conveniently to use the patch ad of Ads Place where you sell the advertising place for a limited time – after the time expiration of ordered ad will appear patch ad. It may be a banner leading to your page of advertisement publication costs or a banner from AdSense. If you select the first option (image mode), tools to download/choosing of downloaded image banner become available for you. Codes – as Ads Place can be inserted into the page code not only as widget, but as a short code or by using function, you can use code “before” and “after” for centering or alignment of Ads Place on the place of inserting or for something else you need. Use HTML tags. Go to the list of Ads Places (Ads -> Ads Places), move the mouse to the desired Ads Place, select in the row menu that appears “View Ads” for the transition to the advertisements list of this Ads Place or “Add Ad” for the transition to the editor of a new ad. If you went to the list of ads, click on “Add New Ad”. Enter a name and a description of the advertisement. These parameters are optional, because don’t influence anything, but help in the visual identification of the ad (do not forget which is which). Ad Weight – coefficient of frequency of show of the advertisement for one cycle of advertisements rotation. 0 – ad is inactive, 1 – minimal activity of this advertisement, 10 – maximal activity of this ad. Use the schedule for this ad – if necessary, select checkbox labeled “Use the schedule for this ad” and set start and finish dates of ad campaign. Use limitation by hits – Use this parameter for limiting displaying of ad by hits. Use limitation by clicks – Use this parameter for limiting displaying of ad by clicks. Prices – your prices for that ad. Ad placement per month – used only for scheduled ads. Per Thousand Hits – Not only humans visit your blog, bots and crawlers too. In order not to deceive an advertiser, you must enable the detection of bots and crawlers. Per Click – To calculate the earnings on clicks, you must enable counting of clicks for that ad. 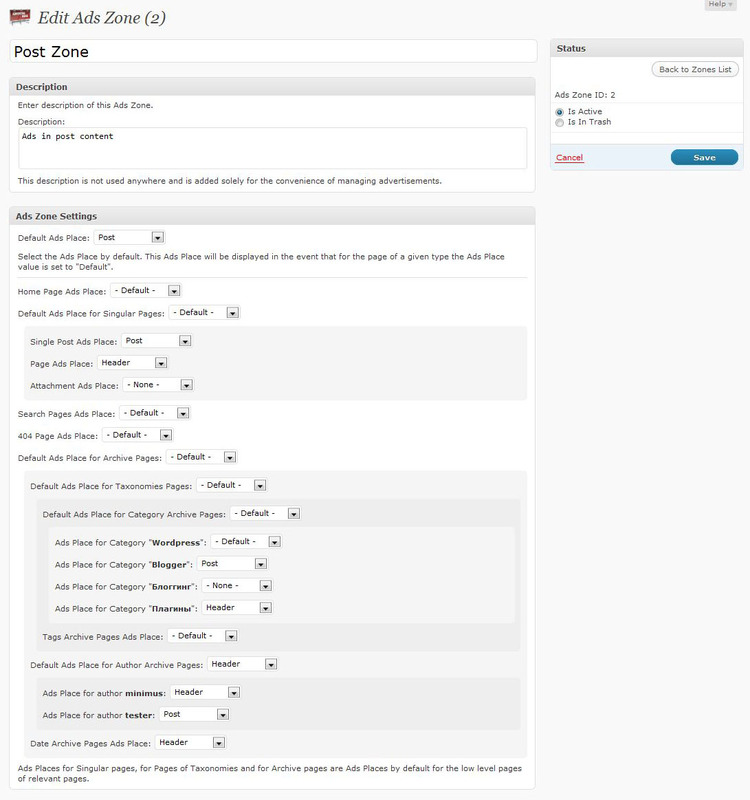 Ads Zone is selector that used to select the appropriate Ads Place for each type of displayed page. Go to your list of Ads Zones (Ads -> Ads Zones) and click the “Add New Zone”. In the opened editor window configure current Ads Zone. Enter a name and a description of the Ads Zone. Select the appropriate Ads Places for each type of page, category or author or leave “Default” value. You can block displaying Ads Place on needed type of page selecting “None” value. Ads Block used for outputting block of ads. Go to your list of Ads Blocks (Ads -> Ads Blocks) and click the “Add New Block”. In the opened editor window configure current Ads Block. Enter a name and a description of the Ads Block. Enter number of lines and columns of Ads Block. After changing these properties you must save Ads Block settings before using Ads Block Editor. Configure styles for Ads Block and Block’s items. Use Stylesheet rules for defining these properties. For example: url(sheep.png) center bottom no-repeat for background property or 5px solid red for border property. Important Note: As the Ads Block is the regular structure, predefined styles of individual items for drawing Ads Block’s elements aren’t used. Define styles for Ads Block Items on Ads Block Editor page! Customize Ads Block structure (select Ads Place or Ads Zone or Single Ad for each item of block). Go to the widgets page (Appearance->Widgets). In the area of available widgets locate widget “Ads Place” and drag it to the necessary sidebar. You can also use widgets “Ads Zone” and “Single Ad”. Title – title of widget. If not needed, leave empty. Ads Place – select Ads Place from a list of all Ads Places. Hide widget style – in some theme templates it is necessary for the sidebar in the blog header. Allow using previously defined “before” and “after” codes of Ads Place – these are the codes that are defined for each Ads Place as “code before” and “code after”. Widgets “Ads Zone” and “Single Ad” can be configured in the same way. Shortcode “sam” enables you to insert Ads Place anywhere in the post’s content. Shortcode “sam_zone” enables you to insert Ads Zone anywhere in the post’s content. 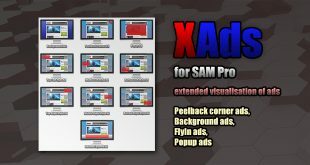 Shortcode “sam_ad” enables you to insert Single Ad anywhere in the post’s content. Shortcode “sam_block” enables you to insert Ads Block anywhere in the post’s content. In order that would insert Ads in any place of theme template, use the drawAdsPlace, drawAdsZone or drawAd functions. codes – bool|array, allow or not allow to use Ads Place codes “before” and “after”. Default “false”. If bool value, codes ‘before’ and ‘after’ will be received from Ads Place record. If array value, codes ‘before’ and ‘after’ will be received from array. Designed for automatic insertion of ad codes before and after the content of single post. Configuring is on plugin settings page. Next SAM. How it works. the reports i’m sending to advertisers are empty. 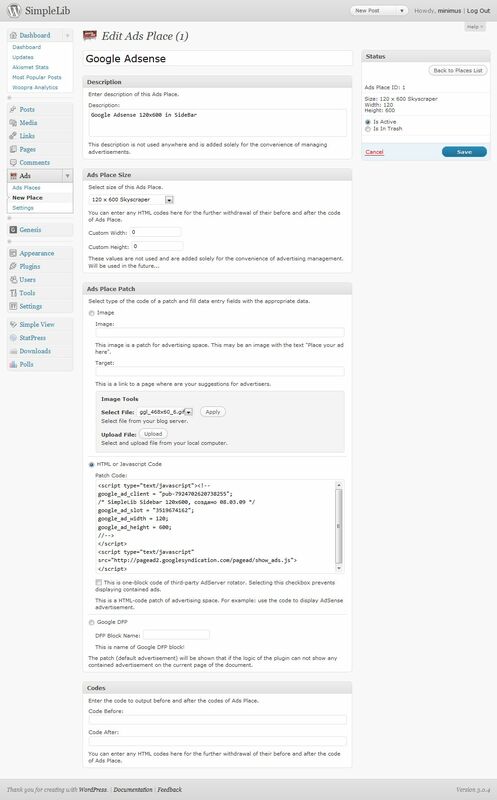 You filled out the required fields on the plugin parameters page? Thanks for sharing about this plugin, it makes our research faster and better. Love your info! We are running several banner ads that rotate in our top leaderboard position and one of our advertisers has provided an animated banner. The animation in this banner does not have enough time to complete before the next banner rotates. Is there a way to adjust the amount of time each banner appears before the next banner rotates? What plugin you use? SAM, SAM Pro Free, SAM Pro Lite? Are the updates for plugin paid?